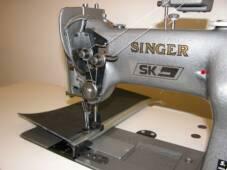 What Can We Help You to Sew? S. Kaplan Sewing Machine Company has been known for innovative solutions to complex production problems in a variety of technical sewn products industries. We can analyze your production requirements, select the proper machines, make recommendations about work aids such as electronic needle positioning motors, pullers, guides and folders. We can provide anything from a simple attachment to an integrated computer controlled machine to automate a manufacturing operation. Please take a look at some of our recent projects below. Large cargo parachutes consist of ribbon type canopies that must be sewn using four needle lockstitch machines. Past and current four needle lockstitch machines could sew a maximum width of 1 1/2", requiring multiple passes if wider ribbons were to be used. We developed sewing workstation using two fully synchronized large bobbin needle feed sewing machines, that allows for the use of wider webbing, increasing the strength of the parachute, while significantly reducing the fabrication time. A fabricator of large tensile structures needed to sew multiple layers of woven polypropylene, cable & reinforced webbing. After the fabric was laid out and cut, attempts at sewing and stapling of components was inefficient and time consuming, as the panels were often over 100' long. We examined the seam construction, and suggested that instead of moving the material through the sewing machine that the sewing machine could be moved along the fabric. 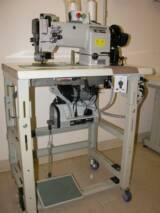 We constructed a sewing workstation controlled by a start & stop button, rather than a conventional treadle. Use of a servo motor and custom built stand made it easy to move the machine along a fabric panel and sew the reinforcing cable & webbing without having to move the panels. Industrial conveyor belts must have a variety of different drive extrusion profiles stitched to belting for various conveyor drive systems. 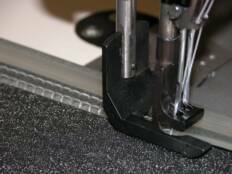 The difficulty in keeping the extrusion in place while sewing in the past resulted in making multiple passes using a single needle machine in order to sew the extrusion onto the conveyor belting. We fabricated custom sewing parts (presser feet, feed dog and needle plates) to accommodate the different profile of each extrusion. A thirty minute change out of these sewing parts, performed by the plant maintenance staff, allows fabrication of belts using the different profile extrusions on the same sewing workstation. insulated tape to be fabricated into ventilation ducts. 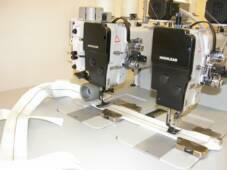 A leading U.S. military contractor acquired a unique sewing machine for the fabrication of tactical restraining tapes, used by the U.S. Military at air bases worldwide. Built in the 1950's the machine was controlled by a series of gears, flywheels and belts, and required multiple operators controlling the machine manually. Many of the original machine functions were unsafe, and no longer acceptable for use in a modern manufacturing facility. We removed the existing manual controls and motors, replacing it with a CNC linear actuator control system. The entire machine is now controlled by one operator, using a touch screen computer interface. 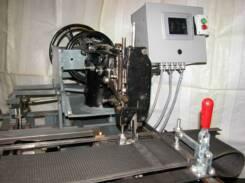 Automated workstation for the production of continuous filter bag tubing. 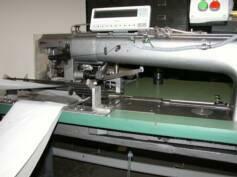 Roll goods are formed into, sewn and rolled up in a continuous tube for further processing into bags. Machine runs unattended, and is designed to stop at thread breakage or material run out until an operator resets the defect and restarts the workstation.